Should We Isolate Ourselves From The Homosexual Community? You are here: Home / Issues of the Day / Should We Isolate Ourselves? Photo courtesy of Stefano Bolognini. Used by permission. It’s all over the news: Christians discriminating and refusing services to homosexuals/lesbians. One of the more recent controversies involves a religious pediatrician who allegedly refuses to treat the baby of a lesbian couple in Michigan. You can read about it in the Washington Post. What are we to make of Christians who would refuse their services to gay people? Some would say that it depends on how the issue is framed. Is it a matter of personal freedom? Is it a matter of personal religious convictions? Is it both? I am not so much interested in issues of personal rights and whether the government can tell us what we are free to do or not to do. The government already does plenty of that, and most of it is good to maintain justice and the preservation of good social order. Discrimination laws do curtail our freedom to select the “who-and-what” we would allow into the sphere of our activities, our business, our investments, and the use of our time, just as much as other laws curtail our actions when they could harm others. It’s already the law of the land that we should not discriminate against homosexuals, no matter what. Evaluate carefully what is being required of you. Can we agree that some decisions in these matters have more lasting, signficant impact than others? For example, I believe there is a big difference between refusing to be the florist or the baker or the photographer for a gay couple’s wedding and refusing to hire a homosexual to teach your children in your Christian school. Hiring a homosexual to teach your children in the Christian school they attend will have more far-reaching, more significant impact than being the florist for a gay couple’s wedding. Where on the scale of gravity do you place cases such as a florist refusing to cater to homosexuals or this pediatrician’s decision to recuse herself as the doctor to care for the Michigan lesbian couple and their baby? Whatever the situation, be fully convinced of your position on a biblical basis (as distinct from a political basis) and decide from the platform of faith what you would do (Romans 14:23). If you refuse to comply with this law on the basis of unwavering biblical convictions, then you should also be willing to accept the legal consequences that come with it. Unfortunately, too few Christians are willing to embrace this biblical teaching. We have no self-sacrificing and inspiring Martin Luther King for evangelicals or Catholics today. Imagine if our U.S. prisons became filled with hundreds of thousands of Christians willing to suffer for their convictions, what would the implications be nationally and internationally? What would happen spiritually? Or legally? Or electorally? Where do I stand in the current debate, especially in light of the pediatrician’s alleged refusal to treat a baby on account that the parents are a lesbian couple? A person has the right to live a homosexual life, just as much as other people are free to engage in some other behavior that I believe to be sinful. They are free to choose. A gay person has the right to be protected from persecution, just as much as any person committing some other sin or anyone who has a religious view contrary to mine. It is as terribly wrong to harass someone for their chosen sexual orientation as it is for punishing someone on account of their atheism. I can already hear some objections such as, “What if pedophiles or drug users demanded rights?” Let them. It would be a good thing if our courts were flooded with thousands upon thousands of lawsuits from such people or, for example, those in the grip of alcoholism (it’s a sickness, isn’t it?) who demanded that any reproach or jeering of their drunkenness be prosecuted as hate speech. Perhaps this will give our lawmakers reason to pause and reflect on the madness of American society and culture. I will also say that I do not believe that supporters of a gay lifestyle have the right to harass people whose religious convictions conflict with homosexuality. What gives homosexuals the right to insult me, call me a bigot, an intolerant fool, a homophobe, and other less flattering things, and not be prosecuted for their hate speech against me? I believe that I have the right to speak up and object to the ongoing calculated push of the gay movement to infiltrate politics and educational institutions or any other venue where they preach their agenda to everyone, especially young minds, without gays and lesbians accusing me of hate speech (I will revisit this matter in a separate discussion of what the gay movement is presenting to our children through television cartoons these days on channels such as TBS). Whenever I evaluate a situation having to do with discrimination laws or homosexuality, here are the biblical principles that guide me. We are to be salt and light in the world. This implies that even as I separate myself from the world in terms of refusing to behave like the world, I am not allowed to cut myself off from the world (John 17:15-18). So as a florist, and even more so as a doctor, I would not isolate myself from those I am called to bless with the light and love of God. In those verses, we are told that “God was in Christ reconciling the world to Himself, not counting their trespasses against them.” This does not refer only to believers. He was reconciling the world to Himself. He was not counting the world’s trespasses against them. Does that include homosexuals? Yes! God was in Christ, reconciling homosexuals to Himself. He does not count the homosexual’s sin against him/her. It is not our mission to condemn homosexuals. Rather, it is our mission to invite them – to beg them on behalf of Christ to accept and embrace the action that God took in Christ (to reconcile Himself to them) and to be reconciled to God. Our mission is not one of condemnation, but of invitation. This raises an important question for our consideration. How can we fulfil our God-given mission to invite homosexuals to be reconciled to God if we boycott their life activities? Who will persuade them of the deep love God has for them if not us? Jesus spent so much time with people whose lifestyle completely conflicted with His own that the religious establishment of His day labeled Him as “a friend to tax collectors and sinners.” (Luke 7:34). He did not embrace their sinful lifestyle, but He did not disengage from them. Dare we do less? Some in the Christian community would say that the homosexual movement is at war with Christianity and that since we are at war, the rules of engagement should be different. But God is not at war with the homosexual movement (He has reconciled Himself to all sinners, including homosexuals). So why would we believe we as Christians are at war with the homosexual movement? 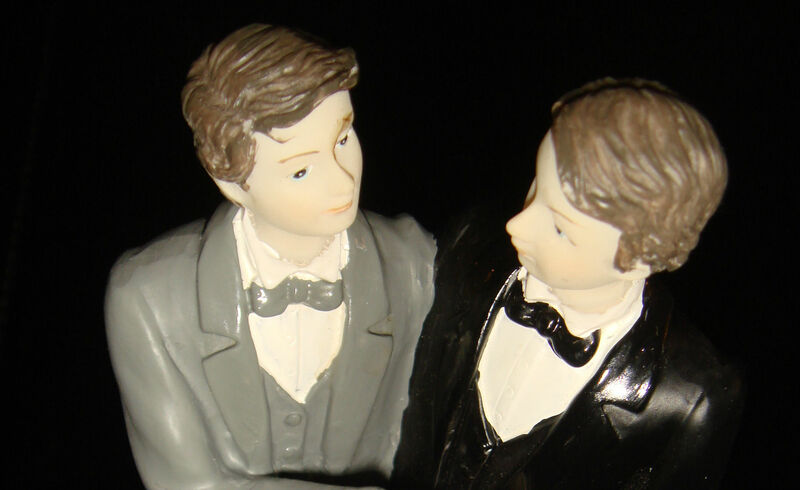 Are We Giving Tacit Approval to Gay Marriage? Others may say that by agreeing to “participate” in a gay wedding by delivering flowers or a wedding cake and helping set up the event, a florist or baker would be giving tacit approval to gay marriage. If we claim to be sons and daughters of the Most High Father, we do not have the option of changing the rules He has set down for us in how we engage others. The Father Himself set the example by making His sun to rise on both the good and bad people and His rain to refresh and supply both of them. So when God makes the sun rise on homosexuals and His rain to refresh and supply them, does it mean He gives His tacit approval to them? Of course not! In light of these passages, what did that pediatrician do? I don’t think there’s a biblical basis for refusing to serve the two lesbians, to say nothing of the innocent baby. Indeed, if we extend kindness and service only to those who are like ourselves and shun those whose morality is not biblical, how can we claim to be like our Savior? The Most High is kind to those who disagree with His standards. Again, dare we do less and still claim Him as our Father? Finally, for those who might argue that the above is not an issue with them, but they resent the government’s imposition of rules that are an affront to their personal freedom, I answer that unless the rule actually causes you to participate in what is morally objectionable, there is more to be gained by embracing the unjust imposition than by bucking it. Why? Because Jesus taught: “…If someone wants to sue you and take your tunic, let him have your cloak as well. If someone forces you to go one mile, go with him two miles.” (Matthew 5:41-42). Going the extra mile gives the opportunity to fully live the Gospel, to be genuine children of our Father in heaven (verse 45) and to be perfect as our heavenly Father is (verse 48). So, we can isolate ourselves and preach about the woes of homosexuality, or we can speak to homosexuals, just as we would do with any other human being in need of God’s love and grace. I have just began exploring your website and am finding your content interesting and thoughtful. I have read the Bible study about Muslim refugees, the prodigal son, and the one about isolating ourselves from the homosexual community. Since the hour is very late I look forward to reading more on another day. There is such absence of love developing in our culture and, on the other hand, such a blind love (or acceptance) of anything and everything with no discernment in many American Christian churches. I’m enjoying the ideas of you both very much.